Habit Psychotria nervosa grows as a shrub to 1.5 meters in height. The leaves are arranged oppositely, to 15 cm in length, broadly lanceolate, with an acute leaf apex and undulating leaf margin. The midrib and secondary veins are prominent. The stipules are large (to 2 cm), and deciduous, leaving a hairy scar. The actinomorphic flowers are arranged in cymose panicles. The calyx has 5 fused green sepals. The corolla has 5 fused, white petals. There are 5 stamens fused to the mouth of the corolla tube. The ovary is inferior with 2 locules and numerous seeds. The fruit is a few-seeded berry that is red at maturity. Habitat: Psychotria nervosa grows in Dry Broadleaf Evergreen Formation – Forests/Shrublands (coppice and scrublands). 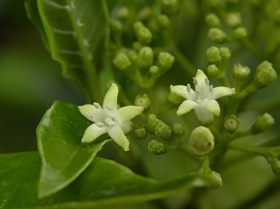 Distribution in Bahamas/Globally: Psychotria nervosa occurs in the central and northern island groupings in the Bahamian Archipelago as well as south Florida, the Caribbean region, Central America to northern South America. Medicinal/Cultural/Economic usage: Psychotria nervosa is not used medicinally in the Bahamas. While it is related to true coffee plants there is not enough caffeine within this species to be usable as a coffee substitute. The flowers are attractive to butterflies and the fruits are attractive to birds.